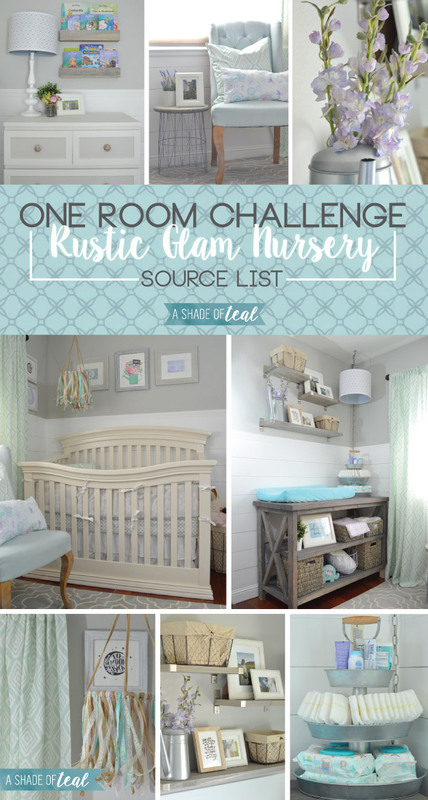 I’m back today to give you the source list for my Rustic Glam Nursery. I absolutely loved how it turned out and I can’t believe it’s done. 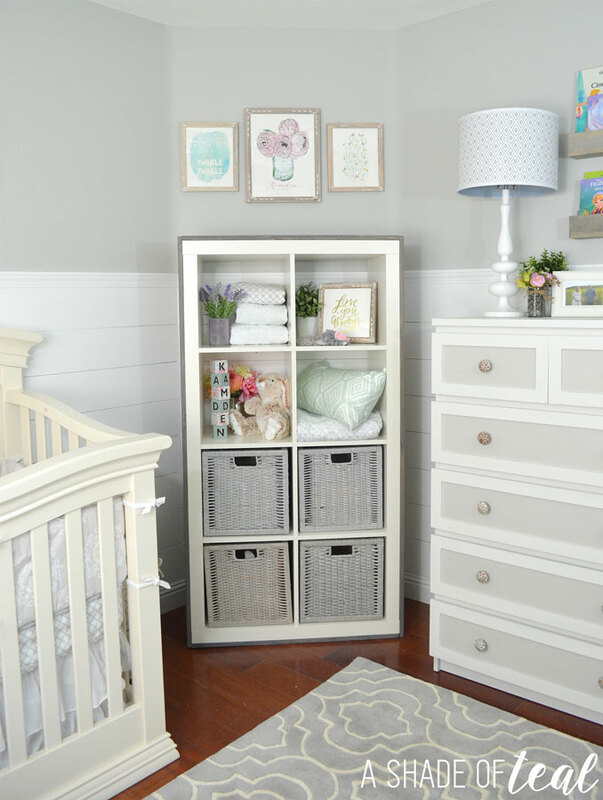 In case you want to know where I found everything to make this Nursery I’ll be sharing that info! 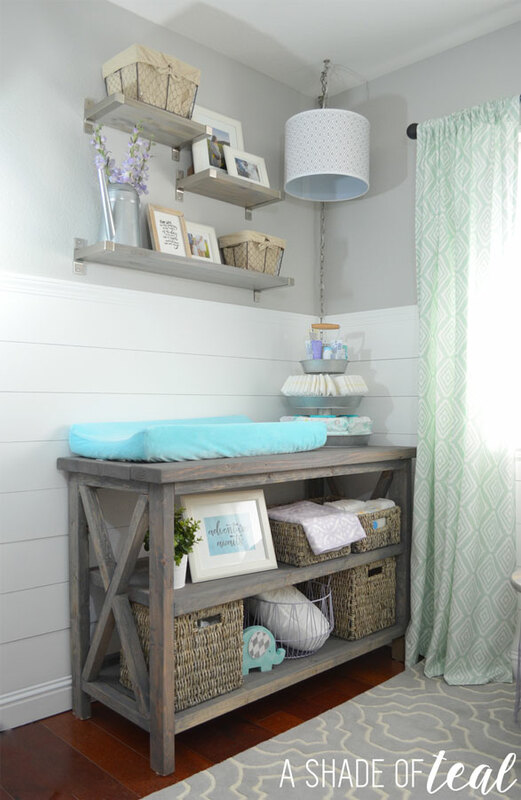 But before I share the sources make sure to check out the entire Rustic Glam Nursery reveal HERE. Rug- From Rugs USA, I purchased the Savanna Moroccan Trellis. For similar Grey Moroccan rugs to choose from find them Here. Chair- Found at Homegoods, here is a similar option. White Butterfly Pillow- Pottery Barn pillowcase that I made pillows out of it. Faux Lavender- here is a similar option. Curtain Rod- here is a similar option. Basket- World Market, similar option here. Crib- Baby’s R Us, similar option here. White cube bookshelf- IKEA Expedit with lumber added from Lowe’s. Grey Baskets- IKEA Branas stained grey. Blocks- DIY project, find similar here. Faux Peonies- Found at World Market, find similar here. 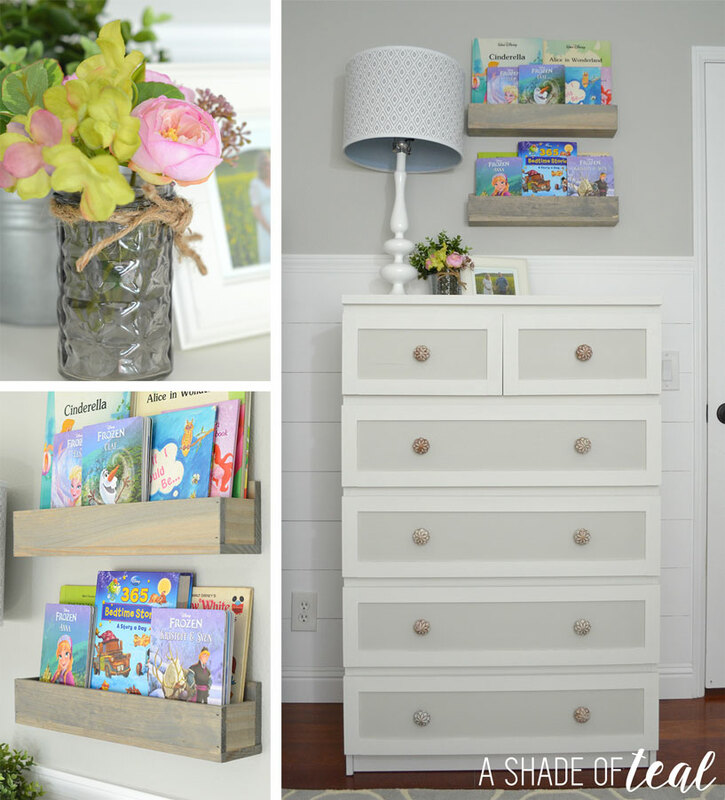 Book Ledges, DIY with lumber & stain from Lowe’s. Dresser- IKEA Malm Hack. Wood trim from Lowe’s, hardware from Hobby Lobby, and Chalk paint from Devine Color by Valspar. Wood Shelves- Wood from Lowe’s & brackets from IKEA. Baskets- Found at World Market, find similar here. Faux Shiplap- lumber from Lowe’s, see a similar tutorial here. Changing Pad- find similar here. I think that’s it, if you see something I missed let me know and I’ll get you the source. 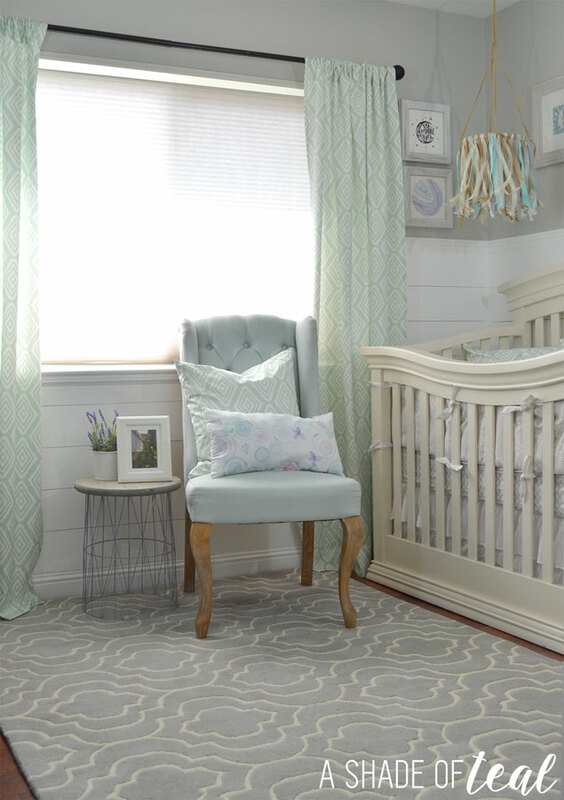 Thank you again to all my amazing sponsors for my Rustic Glam Nursery. I couldn’t have done this room without them. I love the color of your changing table. What did you use to get it that color? 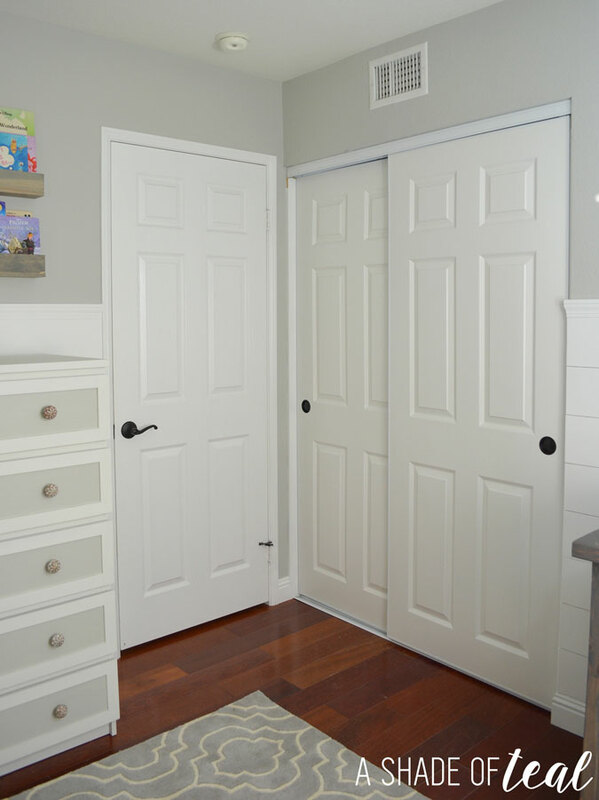 Do you have the plans for the Changing Table- DIY project? Its so cute! The plans can be found on Ana Whites website. I believe it’s called Rustic Changing table.